Josh and I (mostly Josh these days) enjoy going downtown to get our walking in. You can park close to the streetcar line and take off. As long as you can get back to the streetcar, you are never far from your car. There’s always interesting people watching and plenty of things to see. On one of these walks Homeslice Pizza & Pints was noted and the other day we decided to finally check it out. It sits on the corner of Truman Road and Grand, right across the highway from the Sprint Center. It was a beautiful evening and they had the garage door/windows open so I chose a seat next to the window. I beat Josh there and ordered us some waters and the Chicken & Hummus appetizer. He got there shortly and we decided also on “The Wise Guy” pizza for dinner. The only real problem I had with the whole experience is the pizza came out before our appetizer, which was ordered at least 15 minutes before the pizza! They apologized and we ate it anyway. The pizza was good! I’m not a fan of fennel sausage so we substituted it for pepperoni on the pizza and that was the right choice. The whole thing was delicious. It was a decent size for the price too. I had expected it to be skimpier than it was. The Chicken & Hummus appetizer was also yummy. 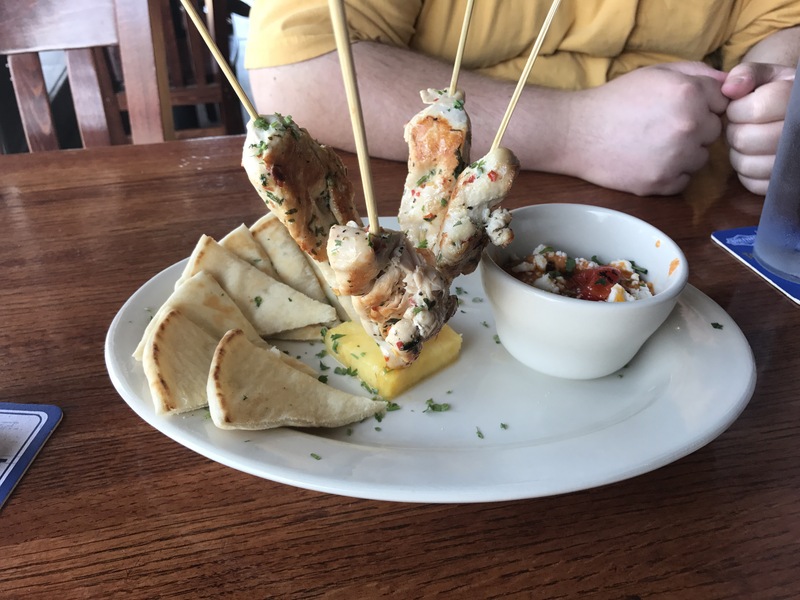 It came with four skewers of chicken, some pita slices and a healthy sized dish of roasted red pepper hummus which was really good. There weren’t enough pita pieces so I resorted to using the pizza crust. Yum! There was some even left over after everything else was gone and I may have ate some with a fork too, it was that good! Overall it was great and I would definitely go again! It gets a 4.5/5 from me! ← Spring time in the city! A winter round up of restaurants.